Goals from Kevin Mirallas and Steven Pienaar secure three points in a 2-1 victory over Hull City Tigers at Goodison Park. 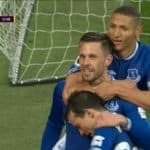 Steven PienaarÂ´s 57th minute strike, just 10 seconds after coming on as a second-half substitute proved the decider in a game in which Mirallas had seen his early strike cancelled out by Yannick Sagbo. 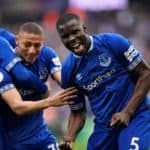 PienaarÂ´s winner ended Hull CityÂ´s impressive four-match unbeaten run and saw Everton moved up to fifth spot in the Premier League. Kevin Mirallas put Everton 1-0 ahead on eight minutes, Hull CityÂ´s first goal conceded in 232 minutes of league football. Hull failed to clear a Baines corner and Leon Osman squared to Mirallas, whose low effort flew past Gareth Barry, standing in an offside position, and the motionless McGregor into the bottom corner. Hull moved level on the half hour mark when Aluko beat Baines down the wing and clipped over a low cross for Ivorian Sagbo to thump in at the near post for his first Premier League goal. 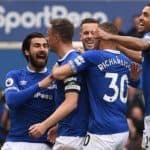 PienaarÂ´s introduction for Leon Osman swung the game back in EvertonÂ´s favour, with the South African turning in a first-time shot from MirallasÂ´s cross to finish a slick passing move that started with goalkeeper Tim Howard.